But, that is where they stop, endorsing. What about fair and equitable coverage? Although I concur with seeing County Councilor David Madore losing his bid for reelection, was it really necessary for the editor to focus half of his editorials since Madore was elected negatively on Madore? And that does not include numerous articles and opinion pieces from others at the Lazy C, just Lou’s Press Talk editorials. Have they ever focused so much on any single elected officials prior to Madore? Say, controversy surrounding Jim Moeller perhaps? Vancouver Mayor Tim Leavitt never received such long term negative coverage even though he blatantly lied on his stance of “No Tolls” in 2009 to win the election. No, he only had to admit “I was wrong” and all was forgiven. By October they endorsed her citing, “Stonier has potential that could flourish into effective service” against the Republican running, Paul Harris. Further indication was seen in the resignations of two separate politicians a few years apart. One a Republican, the other a Democrat. I personally challenged former Columbian writer Stephanie Rice on the disparity of the coverage of the two, the Republican seeing some 14 articles within a week while the Democrat received much less coverage over a month. Giving her the titles and dates from all 14 from their archives drew the response, “And sorry Lew, I didn’t know you were counting columns and editorials” from Ms. Rice. Confronting the editor later on about the disparity drew a comment of “no paper trail” from Lou. Yes, they do dig deep and hard at times. But as we have all too often seen, not all of the time and many stories the public deserves to hear would go unreported, if not for citizens also going out at times and “digging” for information. Fortunately and in agreement with Lou’s assessment of the real necessity of newspapers, other newspapers such as the Willamette Week saw fit to do more of that “heavy lifting” in “digging deep” into the truth about the CRC that the Lazy C declined to address. Instead of owning up to shortcomings and attempting to make reasonable corrections, we see Lou’s latest Press Talk, Life without newspapers? once again return to taking cheap shots at bloggers, boasting of the newspapers worth and all but dropping to his knees to beg people to subscribe. Here’s the thing Lou. People are reluctant to pay for a product they feel is not worth it. Much like soon to be former County Councilor David Madore lashing out at people that openly opposed his reelection bid, you now do the same thing by pointing fingers in every direction and denying what the public, the potential subscribers perceive. Madore lost because he alienated a large segment of the voters. And yes, even though overkill, your excessive editorials contributed to that. But still, his actions turned many former supporters against him. In the same regard, your editorials and reluctance to “dig deep” when the subject may be a Democrat and focus primarily on Republicans or Conservatives has alienated a large segment of the citizens within Southwest Washington. You must be willing to go after both sides with as much zeal as possible if you wish people to subscribe. No one is willing to pay for daily reminders of how awful they are for holding the values they hold. Unlike some others, I neither foresee nor desire the complete demise of newspapers. I desire to see more fair and equitable coverage regarding the political parties. And that is where reputable bloggers come in. Most operate free of charge and also “dig deep” for stories and yes, often link back to newspaper stories. But you neglect to mention that often linking back is to show a fallacy on the part of the newspaper or provide a view the newspaper is unwilling to provide. You see, Lou. Many began blogging to give interested readers a different perspective more in line with their personal values that your paper has long failed to provide. In effect, where you claim to be “holding politicians feet to the fire,” we that blog are doing our job of holding YOUR feet to the fire. Beg away as you wish, but you will never gain the subscribers you want until you offer them the product they seek and deserve. 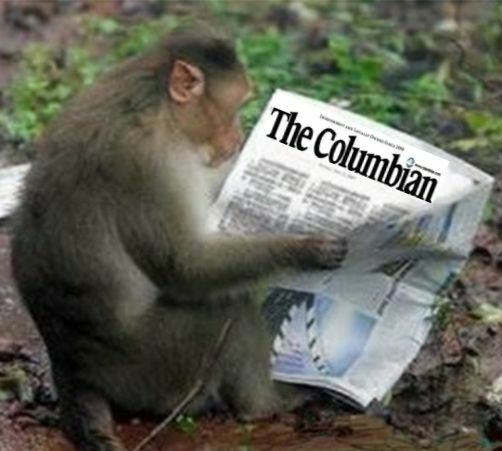 Finally, if blogs are so nonessential and hold little to no value for the public, one must ask, just why is it that the Columbian set up and operates their own blogs?